On days like this I know I am my mother's daughter. Whenever I get stressed, I crave white, starchy and salty, just like my mom. Pasta with olive oil and heaps of grated cheese. (Or, better yet, spaghetti with Meyer lemon and goat cheese.) Bread with butter. 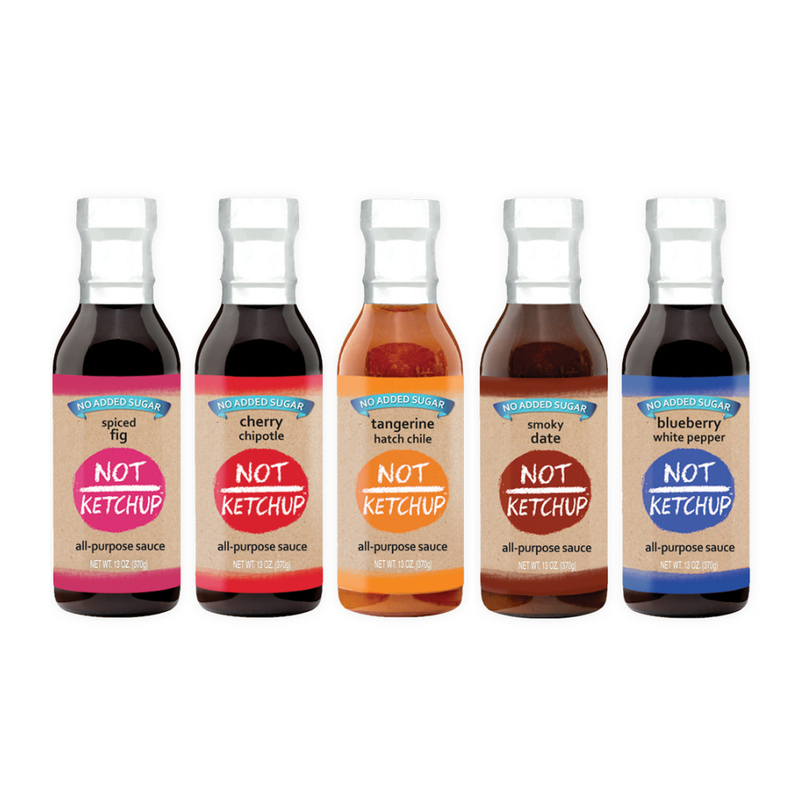 French fries, preferably smothered in gravy. All the stuff I've been trying to avoid over the past few months in the name of better health and losing weight. For years I've been trying to talk myself out of the idea that food equals comfort, reward or celebration. When I need a pick-me-up, I get my nails done. When I deserve a pat on the back, I buy shoes. This is my version of behavior modification, my attempt to break the cycle of overindulgence. When you struggle to maintain a healthy weight, you're always looking for alternative ways to satisfy your cravings. Today it had to be pasta. There was no alternative. We went to C&O Cucina, our favorite pasta spot. The pasta was fine - and yes, it did make me feel better - but, much to my surprise, the garlic knots made the biggest dent in my foul mood. Crispy, salty and slick, bathed in olive oil, garlic and oregano. Soft and white and warm on the inside. They're small enough that you don't start feeling the guilt until your third or fourth. We always bring home leftovers from C&O; between the garlic knots and the fine Caesar salad, we're full by the time our bowls of pasta arrive. 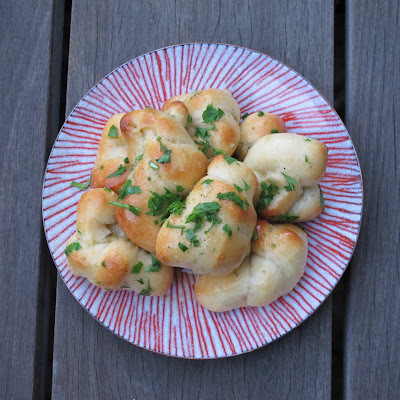 Inspired by the garlic knots at C&O, I created my own recipe several years ago. You tie strips of pizza dough into knots, bake them, then drown them in a nectar of butter, olive oil, chopped garlic and grated cheese. Finish with a shower of chopped fresh parsley, set the bowl on the table, and watch them disappear. Wait for a night when everyone's crabby. 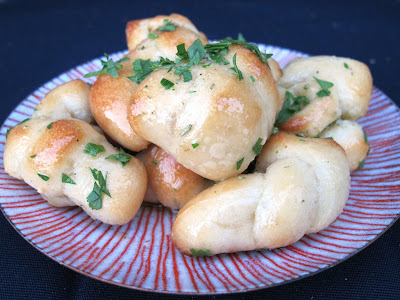 Garlic knots, I assure you, will make you all feel better. Roll out the pizza dough into a rough rectangle, then cut the dough into strips, about 1x4 inches. Tie each strip in a knot and place on a parchment-lined baking sheet. Cover with plastic wrap and let rise about half an hour, until they look a little puffed up. Bake the knots until they start to brown, about 15 minutes. Don't overbake them - you're not going for crunchy. You want them soft. While the knots are in the oven, heat the garlic, oil and butter in a small saucepan over medium-low heat. Simmer about 5 minutes. Do not let the garlic brown. When the knots come out of the oven, tip them into a bowl. Pour the garlic mixture, grated cheese and parsley over the knots and toss. Serve immediately. Looking good as always. I'm telling you again, the pictures are awesome. Don't knock yourself about them. The effort that you put into them truly shows. Definitely, with food, presentation is everything. I'm picking up a garlic knot right now as I speak. It's going in my mouth. UUUUUUMMMMMMM. Tasty. There's an Italian restaurant in Glendora called Petrillo's. I always used to joke with the wait staff about just bringing me bread and butter for dinner, but I was only half kidding. They bake their own yeasty, rich delicious bread there and serve huge baskets of it with dinner. To me, it's the ultimate comfort food and the absolute worst choice for my shrinking backside. Well, OK, maybe a Big Mac is worse. God, I know exactly how you feel!!!! I am always craving pasta in butter or olive oil, salt and parmesean cheese. And I tell myself it's so simple, how could it be bad for you? Now, I make brown rice pasta and put tomato sauce in it. (or Asian style with sesame oil, soy sauce, tofu and some caloric Thai sauce). At the end of the day, I eat so much of the other crap, that I might as well have a bowl of good ol' fashion pasta. Love you! your photos have me drooling and wanting to jump through the computer to eat everything in sight! I am the same, when I am upset it is bread, bread, bread, pasta, pasta, pasta...not sweets but garlicky, buttery, cheesy bread and pasta! I SO want these. Now. It's been a week. Yes, garlic knots are the ultimate comfort food. Wish my hips found them more comfortable!! @Richsistah - you make me blush. Thanks for saying such nice things. I'm tickled. @Hilary - these have GARLIC. That must be better for us than a Big Mac. It's only fair. @Celia - I have to have the real thing, even if it's only once in a while. Substitutes just don't satisfy. @Caren - good to know I'm not the only one! @Kate - it's been a week since what? @Angie - so glad you found your way here and thanks for the compliments! To me, these are the ultimate NY comfort food. Whenever I go home, I always get a slice and a garlic knot from the Shady, or from Raimo's on Old Country Road. Oh yeah, loving the idea and I'll be loving making/eating these this weekend. C&O is one of the things I miss most about LA. These DO look like the ultimate comfort food, especially with the use of ready-made pizza dough. Sorry to hear you had a crappy day, hope things are looking up now! I copied your garlic knots! I just made these with a boxed pizza dough, The box made 8: I ate 4 standing at the counter, watching basketball! Love garlic! I did ovebake because they were not chewy. My daughter makes little puffs with biscuit dough, cut biscuits in quarters; bake; dredge in garlic butter. So so good! Thanks for great recipe! I love to eat this with hot mushroom soup. Thanks for the recipes, will try them out.